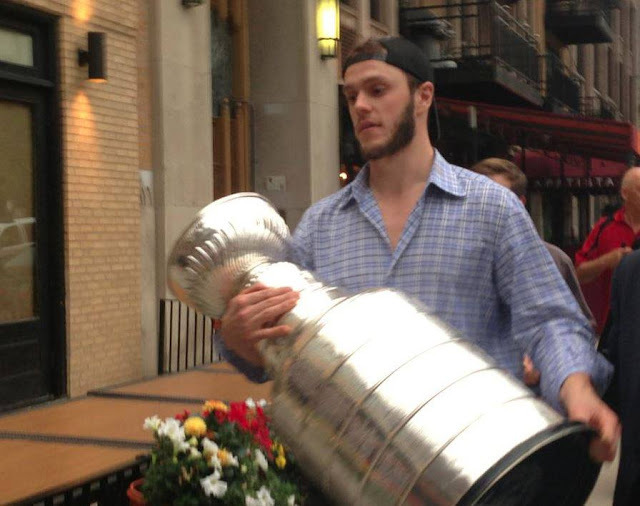 Sloopin - A South Loop Blog: Now We Track the Stanley Cup - Could It Be Sloop Bound? Now We Track the Stanley Cup - Could It Be Sloop Bound? So the Hawks are Stanley Cup champions for the 3rd time in 6 years - pretty freaking amazing! Now the party begins and Chicago's favorite summer game, track the cup, commences. The question for us Sloopers is if the cup could make another appearance at The Scout (1301 S. Wabash). As you may recall, back on Monday, June 24th, 2013 the Hawks clinched their 2nd cup in Boston. Upon returning to Chicago in the early hours of Tuesday, June 25th the first stop was the Sloop. So where will they take the cup? Keep your eyes and ears open!